Old Mother Hubbard Crunchy Classic Natural Dog Treats are wholesome, all natural dog bone shaped dog biscuits oven-baked to preserve the natural flavors in all the varieties dogs love to catch, chew and eat. These Mini Friends natural dog biscuits feature all natural ingredients, natural flavor with the delicious taste of peanut butter, as well as a fun dog bone shape and natural crunch your dog will really enjoy. Dog biscuits, treats and snacks are a great addition to a healthy diet. Snack time is a mutually rewarding show of love and positive reinforcement with your dog. 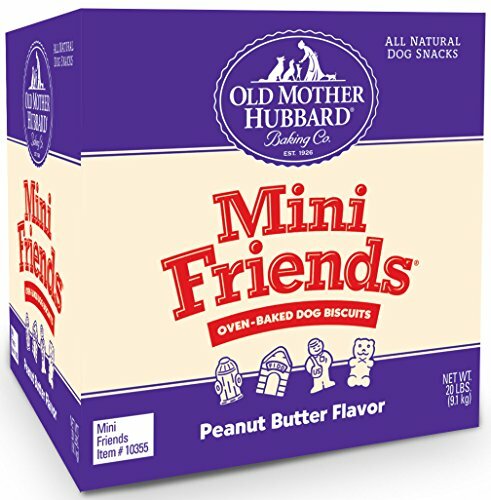 You can feel good about training and rewarding your dog with these Old Mother Hubbard natural dog treats made in USA only. View More In Cookies, Biscuits & Snacks. If you have any questions about this product by OLD MOTHER HUBBARD BAKING CO. EST. 1926, contact us by completing and submitting the form below. If you are looking for a specif part number, please include it with your message.